A trainee guide dog who is sponsored by Weston College has showed off the progress he is making. 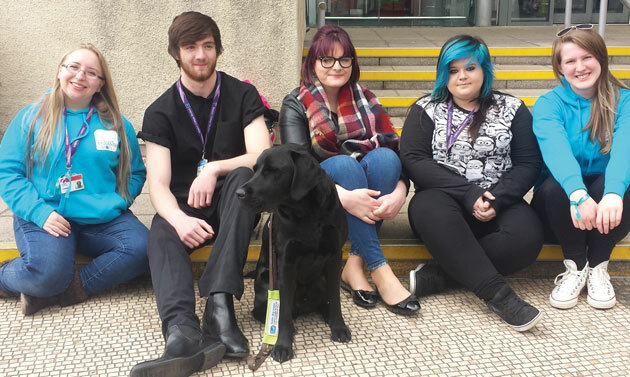 Moodle, the 10-month-old black labrador, proved extremely popular with learners during a recent visit to the college in Weston-super-Mare. They were more than happy to volunteer to help with part of the dog’s training process — getting him used to crowds. Volunteer puppy walker Isabelle Matthews was also on hand to speak about the good work done by guide dogs. Ms Matthews will look after Moodle until he is 13 months old, when he will then be sent to be harness- and road-trained. The college has sponsored Moodle throughout his training process, and receives updates on his progress and training every three months.